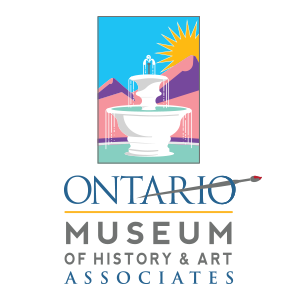 The Ontario Museum of History & Art, Associates is a 501(c)(3) nonprofit support group for the Ontario Museum of History & Art. They provide support financially, through fundraising and membership efforts; educationally, through support of the docent program; and throughout the community with representation at events and activities. In the fall of 2014, Ontario Arts & Culture was created to highlight existing arts and cultural programs in addition to bringing in new ones throughout the City. Members from nonprofit cultural and arts groups are working together to promote and coordinate exciting elements for the community. Developing a city-wide strategic plan for arts and culture that benefits the region, community, and visitors. Supporting programming that develops students and artists through cultivating partnerships with local and regional arts and culture organizations. Providing space in the Ontario Museum of History & Art for educational classes and exhibits for the local and surrounding community. Sponsoring and lead key arts and culture events that positively impact community wellness and economic development. Honoring local and regional people and organizations who have made an impact on the City of Ontario and the Inland Empire Region related to arts and culture. Providing opportunities to bring local and regional leaders around the table to discuss capacity building involving arts and culture. This inaugural award ceremony will honor an individual artist (Tony Sheets); a cultural organization (Sam and Alfreda Maloof Foundation for Arts and Crafts); and patrons of arts and culture (Randall Lewis and the Lewis family).